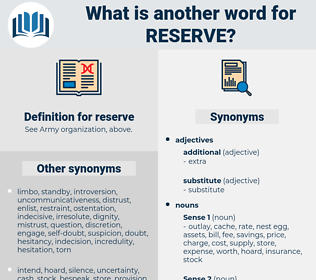 What is another word for reserve? be thinking of/about doing something. Resources, safeguards, precautions, reservation, reservations, Languages, reserva, gangs. qualifications, stores, limitations, concerns, certificates, pools, volumes, caveats, locations, doubts, accusations, holdings, bookings, books, reservations, reservists. reservation, REZ, storeroom, proviso, riserve, reticence, qualification, stockroom, restraint, storage. reservation, reservations, earmark, pre-book, save, conserve. friendliness, warmth, nothing, emptiness, debt. loquacity, incontinence, prototype, confidence, indiscretion, arrogance, loquaciousness, self-sufficiency, Immoderacy, assurance, original, sociability, assumption, unrestrainedness, archetype, gratification, conceit, Self-conceit, indulgence, intemperance, sauciness, haughtiness, impudence, forwardness, overindulgence, pertness, self-indulgence, egotism. release, hurt, distribute, squander, use, throw away, expedite, waste, offer, spend, let go, give. But I reserve it until the others have spoken, and then I shall introduce it to wind up. The good wife had a second in reserve. resurvey, recurve, rock group, resorb, riser pipe, rock crab, regroup. call for, request, quest, bespeak, ask for.